This is a guest post by Roger Warner of Content and Motion. Here’s classic example of how badly some companies are screwing up on social media. 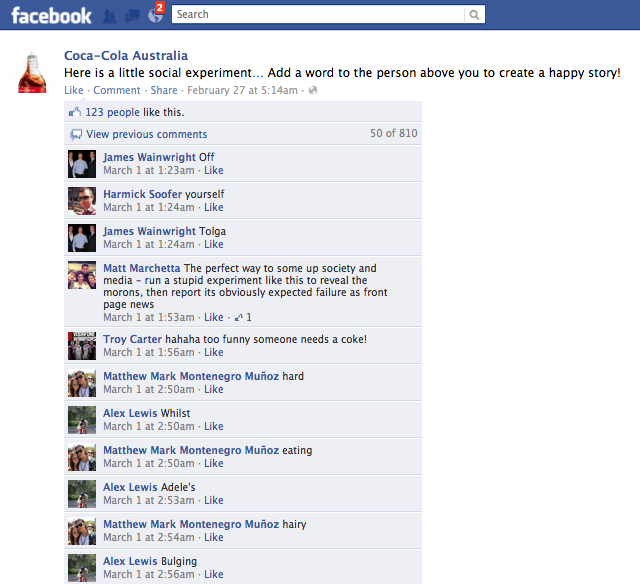 Back in February this year Coca-Cola Australia invited its fans to some ‘banter’ or chat. Fans obliged. Much fun ensued. Coca-Cola looked stupid. What’s happening here? Coca Cola has invested tirelessly in its brand for the past 50 years. Now some bright social media spark is conducting inane ‘little experiments’ for social media ‘engagement’ that seem hellbent on killing it. Exactly the same thing can happen when young startups try to engage on social networks and think they have to “engage”. Sadly, Coca Cola’s approach to engagement is not the exception, it’s the rule. It’s the “Hi, how was your weekend?” approach to brand communications on Facebook, Twitter, and so on. Plenty of tech companies find themselves in this trap, not just consumer brands. This is classic conversational, open and ‘authentic’ dialogue that seems to satisfy the pervasive ethos of social media (make nice) but at the same time totally messes with any concept of a brand. It can vastly over estimate the average person’s appetite for holding conversations with the products and services they use and follow on Facebook. Startups, companies and brands that are following this path are getting it very wrong indeed. • People don’t use Facebook in order to forge a relationship with Coca-Cola (or any other brand). They use it to create and enhance relationships with other people and to tell their own life stories (via sharing). • People believe in brands. Some folks buy the Burberry label instead of Wallmart own brand and are very happy with the price tag. Bland conversations and banter undermine the strength of a brand (and price) because they’re reductive: they strip out the magic and create a level playing field. Any brand can play the ‘authenticity’ game. • People are tuning out from mundane ‘experiments’ and boring, self-serving brand ‘conversations’. They simply don’t compete in a news stream that includes raunchy pictures from Friday’s drinks at the office. Further, it’s more fun to sabotage them than to play along. So what else should you be doing on Facebook? Great ‘social brands’ enhance the ‘personal brands’ of their fans. Put bluntly: You make them look better. They transform the average stuff of life into something more valuable and meaningful. They create stories to share by giving people great content and experiences that makes them feel smarter, cooler, more generous and generally more heroic. The will to empower creates the will to share. The winners in this game know that any given Facebook play must be geared to creating (relative) fame and/or thanks for others. And they understand that if they can do this, then good things will follow: shares, Likes, comments and, in turn, brand awareness, traffic and referrals. In the near term future, these brands will flourish in the Social sphere – they’ll generate a tangible benefit from their spend and their Social Media teams will earn more respect, industry awards and money. Their work will evolve around a firm but basic understanding of what people really want from their time on Social Media – kudos. They’ll be able to extend the brand in new engaging ways by creating lots of very personal missions on new platforms and devices, in all kinds of day-to-day environments that they don’t currently enjoy a presence – from the breakfast table to desk to couch and back again. Success – and a more powerful Social brand – comes via an understanding of how, why and where a brand can generate personal kudos in amongst the flux of daily life and leveraging the best technology available to make it easy and support the cause. • Create an email intervention in the workplace? Sure. I’m a smart working hero, I’m in. • Deliver a can of personalised chicken soup to a flu-bound spouse? I’m a progressive, caring husband with a sense of humour. Show me how. • Wage a war against over priced, over specced shave tech (and Roger Federer)? I’ve always thought seven blades was pointless. Where do I sign? • Rewire for social. Your biggest ideas must be about them, not you. • Start trying to make your fans’ life stories more heroic. • The will to empower creates the will to share. Do this and you will win on Facebook and most other Social Media channels… and I guarantee it’s a hell of a lot more ‘engaging’ than banter.